IN 1993, President Clinton signed Public Law 103-199, authorizing a memorial in Washington to those who died in the "unprecedented imperial Communist holocaust" that began in 1917. It is a memorial long overdue. And it is well-suited to Washington, the capital of the Free World and the headquarters of what President Kennedy called the "long twilight struggle" against the totalitarians of the left. When completed, the Victims of Communism Memorial will include a museum documenting the crimes committed by the disciples of Marx and Lenin; original artifacts from the bitter night of Communist brutality (a piece of the Berlin Wall, a cell from the "Hanoi Hilton"); and a database preserving the names of those wiped out in history's greatest slaughter. V.I. Lenin: 'We have never rejected terror." Or at least as many of those names as can be identified. For it is impossible that we shall ever know them all. Every one of the hundreds of thousands of Cossacks butchered on Lenin's orders in 1919? Every Miskito Indian killed in Nicaragua under the Sandinistas? Every Chinese peasant, all 2 million-plus, obliterated during Mao Tse-tung's "land reform" in the early 1950s? Impossible. For pure murderous evil, there has never been a force to compare with communism. The Nazis didn't come close. The Holocaust was uniquely malignant — never before or since did one people construct a vast industry of death for the sole purpose of rounding up and destroying every single member of another people. But the Nazis exterminated 11 million innocents; the Communist death toll surpasses 100 million. Nazi power lasted from 1933 to 1945. The Communist nightmare began in November 1917, and continues to this day. Savagery has always been a hallmark of communism. It is an ideology that requires the destruction of human beings. 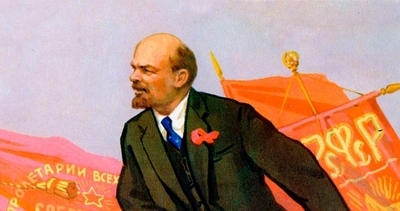 "We have never rejected terror in principle," wrote Lenin in 1901, "nor can we do so." Half a century later, even as he denounced the extremes to which his predecessors went, Nikita Khrushchev vowed that the terror so esteemed by Lenin would go on. "The questioning of Stalin's terror," he cautioned the Twentieth Party Congress in 1956, "may lead to the questioning of terror in general. But Bolshevism believes in the use of terror." Not long afterward, Khrushchev sent 3,000 Soviet tanks to crush the Hungarian freedom fighters. 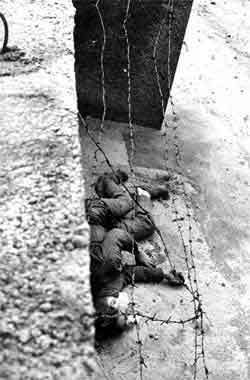 Peter Fechter, 18, bleeds to death after being shot by East German guards at the Berlin Wall. Communism equals murder. Everywhere. Always. Communism equaled murder in Ukraine, for example, where 7 million people were starved to death on the Kremlin's orders. "If you go now to the Ukraine or the North Caucuses," wrote British journalist Malcolm Muggeridge in 1933, "exceedingly beautiful countries and formerly amongst the most fertile in the world, you will find them like a desert . . . no livestock or horses; villages deserted; peasants famished, often their bodies swollen, unutterably wretched." Farmers who took grain or vegetables from their own land were shot. Dead bodies littered the streets of Kharkov, the capital. "It was," an eyewitness later recalled, "as if the Black Death had passed through." Communism equaled murder in Ethiopia, where Mengistu Haile Mariam became dictator in 1977 and embarked on what he called his "Red Terror." Tens of thousands were massacred, including the graduating seniors of almost every high school in Addis Ababa. 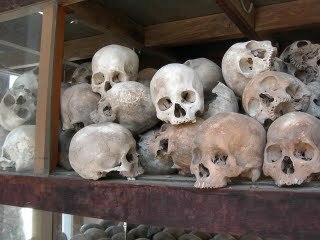 Communism equaled murder in North Vietnam as far back as 1945, when Ho Chi Minh resolved to annihilate his Nationalist rivals. "It was appalling," recorded the historian Lucien Bodard. "Thousands, maybe tens of thousands of men had been liquidated. . . . The intention was that horror and dread should extinguish the last trace of respect for them among the masses: Their execution had to be both shameful and terrifying. That was the reason for the mass executions of hundreds at once, the fields of prisoners buried alive, the harrows dragged over men buried up to the neck." Communism equaled murder in Tibet, where Mao's campaign to extirpate Buddhist culture turned 1.2 million Tibetans into corpses. It equaled murder in gentle Cambodia, where the bloodlust of the Khmer Rouge vaporized one-third of the nation in less than four years. It equaled murder in Cuba, in East Germany, in Afghanistan. From Stettin in the Baltic to Trieste in the Adriatic — murder. In the Gulag and the laogai — murder. At Tiananmen Square — murder. In the Korean War and the Vietnam War, in the forest of Katyn and the dungeons of the Lubyanka — murder. One hundred million victims of communism. And those are only the victims who were slain. It doesn't include those who were maimed or driven mad. Those whose lives went dark when a loved one was butchered. Those who spun out their years in potato queues, in vodka stupors, in daily fear. It doesn't include those who wasted 30 years as slaves in Siberia. The boat people who flung themselves into the South China Sea. The pope, shot by a killer in the pay of the Evil Empire. The stifled poets, the gagged priests, the tormented refuseniks, the exiled democrats. Rarely do we think of them, or of the hundred million. We forget how pathologically evil communism has been, or why we poured so much blood and treasure into fighting the Cold War. It is to correct that amnesia that the Victims of Communism Memorial will be built.